The Elgin valley region shone in the magazine’s panel tasting with an impressive five of the top seven wines hailing from Elgin. This is a remarkable performance for an area that accounts for only 1.48% of the total South African Chardonnay plantings! 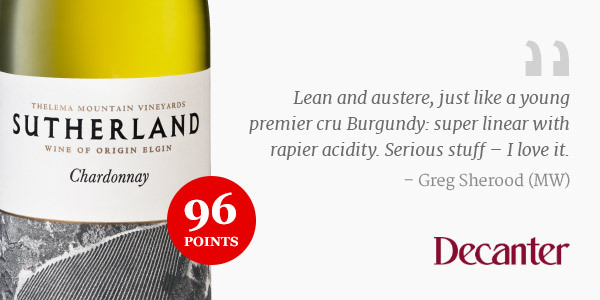 Gyles, whom the magazine described as “a pioneer in Elgin”, has said in the past that Chardonnay shows a lot of promise and is likely to be the best grape variety for the area. 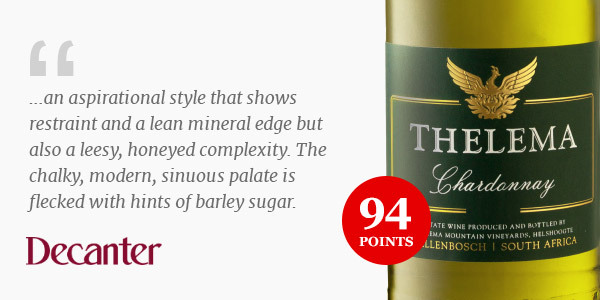 Thelema Chardonnay 2014 also impressed the international judges on the panel. The awarded 94 points is a wonderful follow up to the gold medal it received at the International Wine Challenge competition in 2016. The tasting notes describe the wine as “an aspirational style that shows restraint and a lean mineral edge but also a leesy, honeyed complexity. The chalky, modern, sinuous palate is flecked with hints of barley sugar” and is always a firm favourite at the dinner table of the Webb families. We have been overwhelmed by the positive response to the good news communicated and would like to inform you that these vintages will soon sell out. To avoid disappointment, please ensure you get your orders in as soon as possible.